The first of the June School Holiday programs drew a big crowd of children keen to create and make something wonderful with their hands. 2011 is the International Year of Forests, and the EPA Division’s Community Sustainability Officer Maree Bakker used this theme to ask children to explore some creative ways of reusing paper. 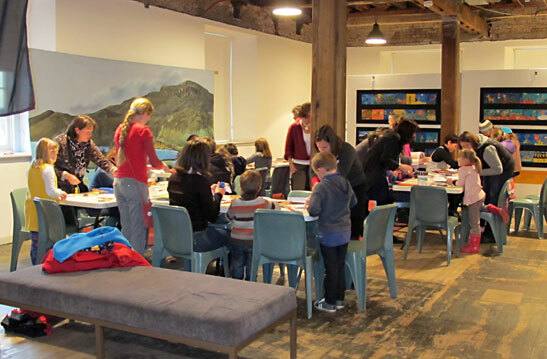 Her call was answered as more than 80 children, parents and carers dropped into the three-hour school holiday session held in the Commissariat Store, off the TMAG courtyard. Throughout the all-ages, free event, participants re-used old museum calendars, along with an assortment of paper and cards, and transformed them into gift-tags, bags and boxes. Coordinator Museum Discovery, Kate Morris, says the School Holiday sessions are designed to encourage parents, guardians and older friends to join in and help younger children explore the Museum. “The turn-up for the first of the TMAG June programs was really fantastic,” Kate said. Re-use is a central theme of Maree’s work as a Community Sustainability Officer with the EPA Division. As part of her role, Maree coordinates the annual Bricolage Design Prize, which challenges innovators and designers to find an ongoing source of waste and develop it into a marketable product. Maree says Bricolage is derived from the French word bricoleur, and means the “creative and resourceful use of whatever materials happen to be available”. The School Holiday sessions operate on a drop in basis from 11am-2pm and will continue on Wednesday 15th June with Volcano Lab, where children are asked to become a do-it-yourself scientist with AccessArt and create their own mini-volcanic eruption to add to the Volcano Lover installation at the Museum in Art Gallery 4. On Thursday 16 June, children are asked to ponder ‘What’s big, red, and eats rocks?’ and ‘Can animals turn into stone?’ as they have fun uncovering the links between zoology and geology in the Zoology Gallery. More than 80 children, parents and carers attended the ‘Celebrate and Create’ session.